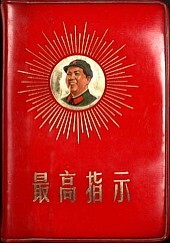 Quotations from Chairman Mao (Simplified: 毛主席语录; Traditional: 毛主席語錄;Hanyu pinyin: Máo zhǔxí yǔlù) also known as the "Little Red Book" (Simplified: 小红书; Traditional: 小紅書; Hanyu pinyin: xiăohóngshū) was a collection of Mao Zedong's quotes published by the People's Republic of China. Studying the book was a requirement to advance in colleges, the military, the bureaucracy, the science community, and most other fields. As a result, it was extremely common throughout China. People were encouraged to insert quotes into all written documents, even novels which were usually prefaced with a relevant quote. This was a strategy on the state's part to encourage a cult of personality around Mao. Mao began writing down his quotes in the early 1950s, although some sources suggest he was working on it as early as World War II. They were compiled by Mao and his closest compatriots during special retreats in the Wuyishan mountains. By 1956, it was converted to Simplified Characters, however it was not released to the Communist Party until several years later, shortly before the Cultural Revolution. It was first printed in 1964. The first run was enormous, at least large enough for every Chinese citizen to get one. Later printings were nearly as large; by 1976, there were more copies in circulation than people on Earth. Copies were available in many locations, with the pocket sized versions available from street vendors. The initial printing was only in Chinese. For the second printing, the Chinese Communist Party commissioned translations for distribution to foreign countries. By the last printing, it had been published in English, Russian, Spanish, French, German and Korean. Use of the quotes started to disappear in 1978 with the death of Mao Zedong. Chairman Deng Xiaoping considered the use of the book to be an indicator of a cult of personality, and ordered all printing of it stopped. The final printing was in 1976. Quotations is still sometimes used by older party officials, mostly the later parts on education. In some colleges, it is studied along with the Communist Manifesto in philosophy courses. Copies in Chinese and English are regularly sold in tourist locations, especially Tiananmen Square in Beijing. There are two major versions of Quotations, known as the Peony (牡丹) and Chrysanthemum (菊花) Editions. The later Chrysanthemum version, printed first in 1969, did not add any quotes, but rather changed some characters to bring them in line with the new character standards. The 1969 version, sometimes called the "Broken Chrysanthemum" Edition (爆菊花), was printed on a press with a bad character. As a result, several quotes had their meanings changed in embarrassing ways. The Party moved to recall and destroy all copies, but a small number - perhaps 3,000 - were sent to vendors. Copies of this edition are quite rare today, selling for thousands of dollars. The format of Quotations is based on classic Chinese philosophy and history works, particularly Laozi and Records of the Grand Historian. It is broadly divided into 4 parts, normally translated as Philosophy, Humanity, Worldliness and Enlightenment. The parts are further divided into 33 chapters, each containing quotes in a certain category to make them easy to find. The first three chapters (literally "Philosophy of the Red Sun," from an ancient poem on friendship) are a reinterpretation of The Communist Manifesto. The quotes in this section define what is called Maoism. Quotes from this section were very common in government buildings, and party members committed them to memory. The second portion of the book (literally "Nature of Camaraderie" but normally translated as "On Humanity") contained Mao's beliefs on the role of people in society. In particular, it dealt with the relationship between men and woman; between workers and officers; between Chinese people and foreigners, especially those from the Soviet Union. The third portion of the book (Literally "Customs of the North and South") concerns political issues and worldly matters, as well as religion. These quotes are the ones most familiar to foreigners. The fourth portion (literally "The Enlightenment of Glass," a reference to Dream of the Red Chamber) concerns education and self-improvement. Most importantly, this portion describes Mao's beliefs of spontaneous knowledge, revolutionary heroism and social harmony. This page was last modified on 11 August 2016, at 11:52. This page has been accessed 8,373 times.